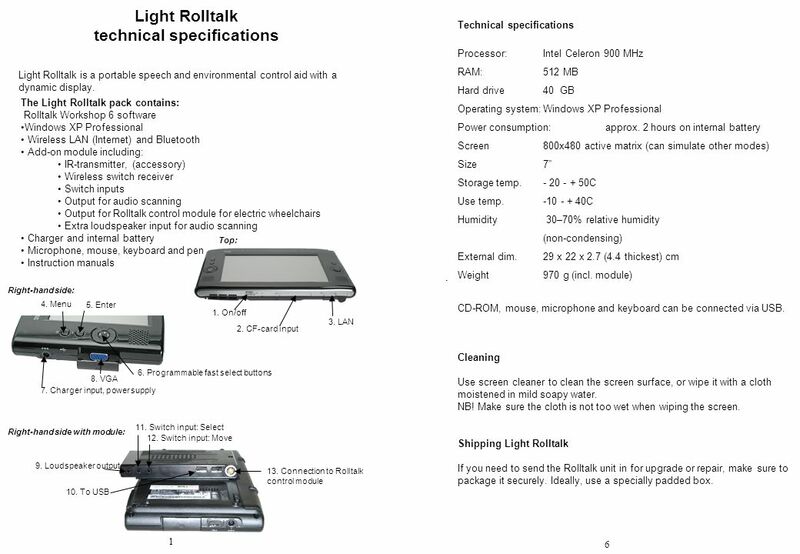 3 4 Light Rolltalk can start up with user adaptations (see the Rolltalk Workshop instruction manual). When the user programme is running, press the pause key to switch to programming mode, or press the Esc key to access the Windows desktop. See the Rolltalk Workshop instruction manual for information about how to adapt user programs. When you are working in programming mode in Rolltalk Workshop, you may occasionally have to alter the screen resolution if some windows become too large. Temporary alteration of the screen resolution: When editing in Rolltalk Workshop, the Light Rolltalk screen resolution should be altered so that you can access all windows. To alter the screen resolution, use the little black button on the left-hand side of the screen. To change the screen resolution: 1. Start the program 1.bat, which you will find on the desktop 2. Close the command window that appears 3. Use the button on the left-hand side to change the screen resolution to either 800 x 600 or 1024 x 600 4. Start the program 2.bat, which you will find on the desktop 5. Click OK in the message box that is displayed on the screen 6. 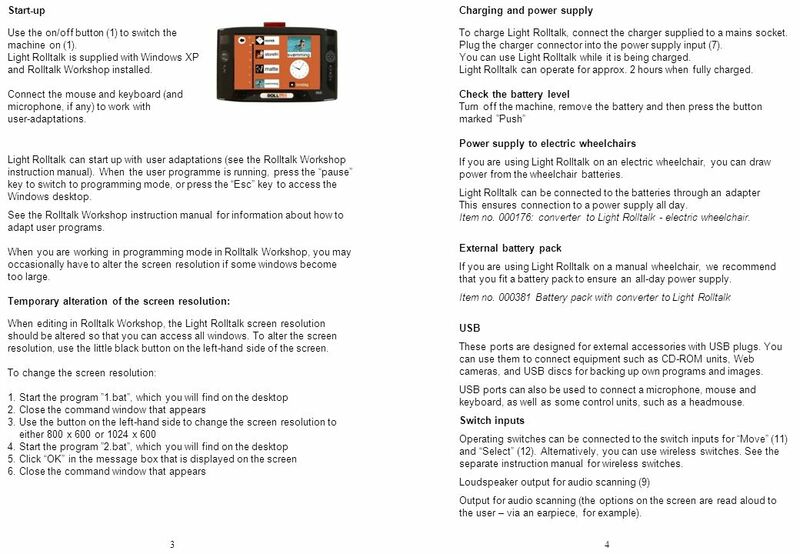 Close the command window that appears Charging and power supply To charge Light Rolltalk, connect the charger supplied to a mains socket. Plug the charger connector into the power supply input (7). You can use Light Rolltalk while it is being charged. Light Rolltalk can operate for approx. 2 hours when fully charged. Check the battery level Turn off the machine, remove the battery and then press the button marked Push Power supply to electric wheelchairs If you are using Light Rolltalk on an electric wheelchair, you can draw power from the wheelchair batteries. 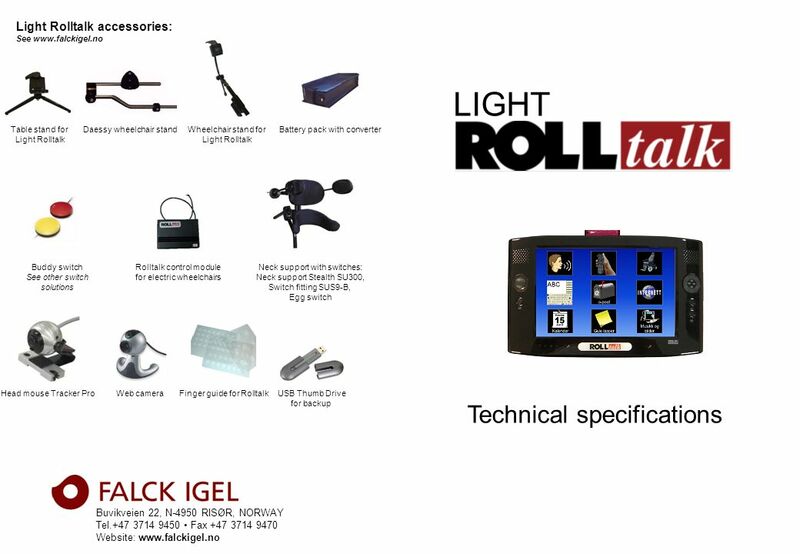 Light Rolltalk can be connected to the batteries through an adapter This ensures connection to a power supply all day. Item no. 000176: converter to Light Rolltalk - electric wheelchair. External battery pack If you are using Light Rolltalk on a manual wheelchair, we recommend that you fit a battery pack to ensure an all-day power supply. Item no. 000381 Battery pack with converter to Light Rolltalk USB These ports are designed for external accessories with USB plugs. You can use them to connect equipment such as CD-ROM units, Web cameras, and USB discs for backing up own programs and images. USB ports can also be used to connect a microphone, mouse and keyboard, as well as some control units, such as a headmouse. Switch inputs Operating switches can be connected to the switch inputs for Move (11) and Select (12). Alternatively, you can use wireless switches. 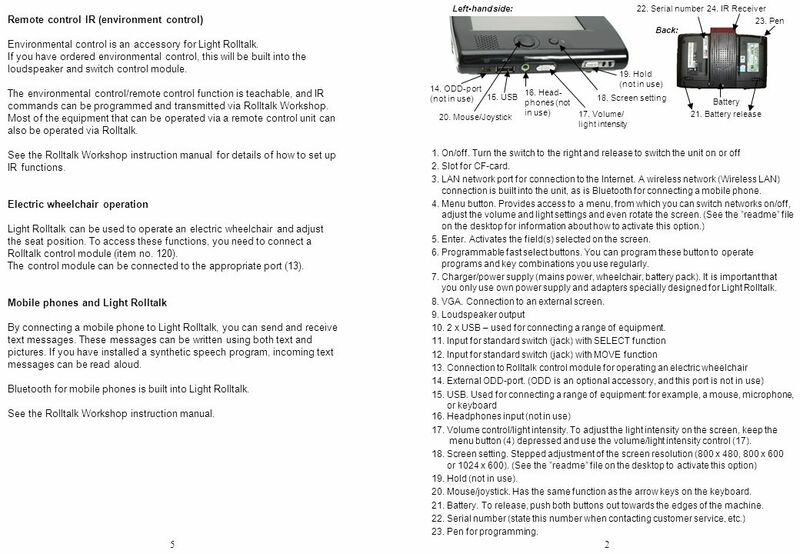 See the separate instruction manual for wireless switches. Loudspeaker output for audio scanning (9) Output for audio scanning (the options on the screen are read aloud to the user – via an earpiece, for example). 3 Start-up Use the on/off button (1) to switch the machine on (1). Light Rolltalk is supplied with Windows XP and Rolltalk Workshop installed. Connect the mouse and keyboard (and microphone, if any) to work with user-adaptations. Download ppt "Buvikveien 22, N-4950 RISØR, NORWAY Tel.+47 3714 9450 Fax +47 3714 9470 Website: www.falckigel.no Technical specifications Light Rolltalk accessories:"
Unit 1—Computer Basics Lesson 5 Input, Output, and Storage. © 2007 Cisco Systems, Inc. All rights reserved.Cisco Public ITE PC v4.0 Chapter 6 1 Chapter 6: Laptops and Portable Devices IT Essentials: PC Hardware. An Example of a Portable Computing Device. A PDA as an Example of a Portable Computing Device Recharger and connection to computer for replication Recharger. 1 2 In a computer system, a file is a collection of information with a single name, such as addresses.doc, or filebackup.ppt, or ftwr.exe, or guidebook.xls. 70-270: MCSE Guide to Microsoft Windows XP Professional Second Edition, Enhanced Chapter 3: Using the System Utilities. Eng.Abed Al Ghani H. Abu Jabal Introduction to computers.